What’s the difference between grass-fed and grain-fed beef? As it turns out, there is quite a big difference. Not only for the animals themselves but for us and the environment. 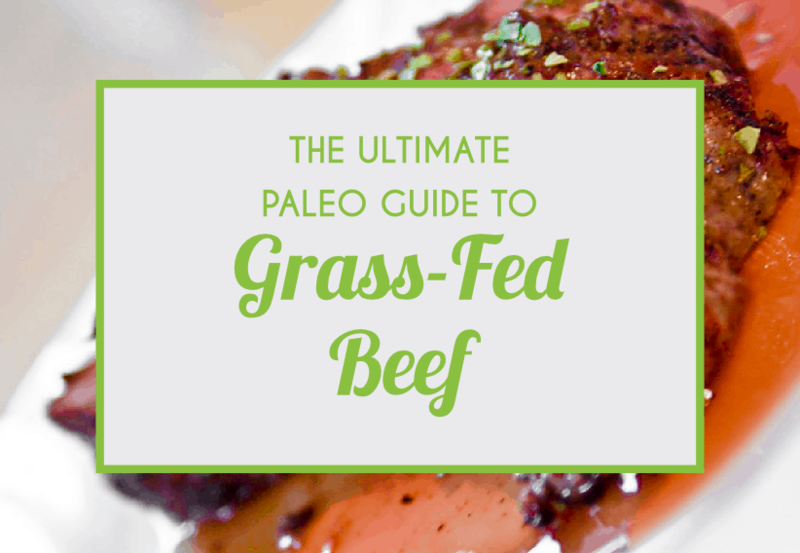 If you’re new to the paleo diet, you may have heard or read about the emphasis on consuming grass-fed beef. 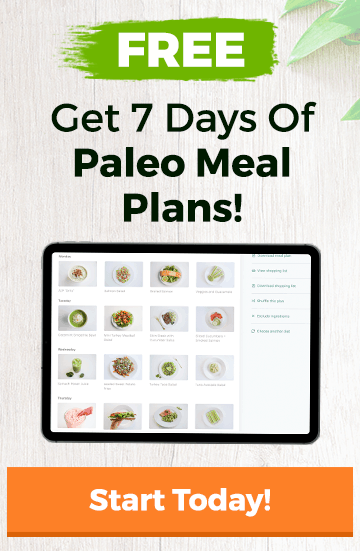 Or maybe you’ve been paleo for a while and you have your grass-fed game on point, but you’re not exactly sure why you’re consuming it rather than grain-fed beef. As a little prerequisite to this guide to grass-fed beef, I recommend taking some time out of your day to review some of the buzzwords used in the food industry, so that you understand what each one actually means. Words like “natural”, “free-range”, “organic”, “pasture-raised”, and “grass-fed” might not mean what you think they do. Traditionally, all meat was grass-fed and and the animals it came from were free to roam pastures, consuming the foods available to them in their natural habits. 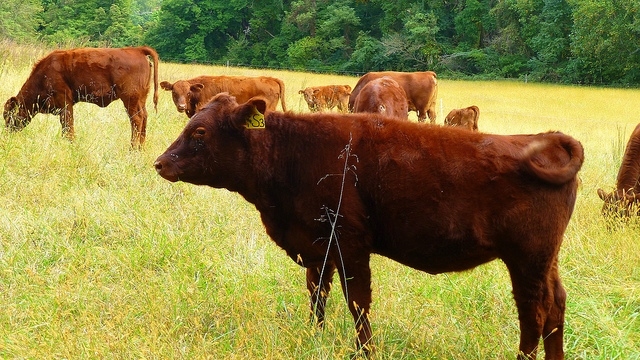 This post covers the steady return towards the consumption of grass-fed animals. It’s great to see that so many of you are considering how animals are treated, the way feedlots and factory farms are operating, and the environmental footprint that you leave on this world. What The Heck Is Grass-Fed Beef? 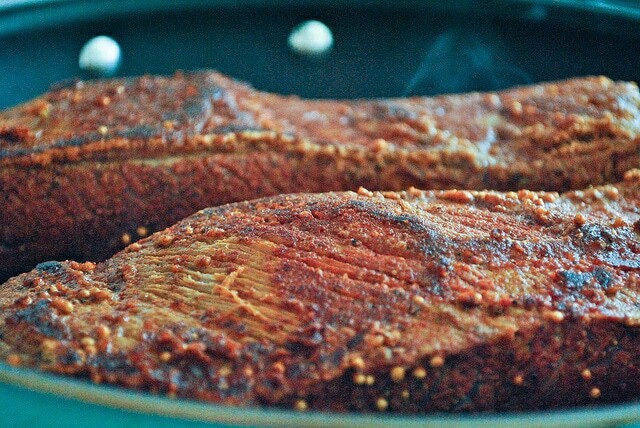 Beef and the majority of red meat is slow-twitch muscle fiber, while white meat is fast-twitch muscle fiber. Beef is red is because of the amount of myglobin it contains. When cattle eat grass, they could be eating anything from the grass on your front lawn to bamboo or even the other types of grasses found around marshes and along the side of the road. They could also be eating the leaves of other plants, like weeds, bushes, and alfalfa. As you can see, during the life of the animal, it is storing up nutrients in its muscles for humans to eat. The better the quality of the soil in which the plants the cows eats grow, the more nutrients the cow will end up storing in its flesh. A real grass-fed animal is free to roam and consume not only grasses but also graminoids such as wild marsh, rushes, lawn, bamboo, shrubs, and cloves. These animals spend their entire lives feasting on foods like this. There is no grain, soy, corn, and another such products found in their diets. There can be some confusion when it comes to the terms that are placed on the labels of beef. You’ve probably seen not only grass-fed beef but also pasture-raised, organic, and vegetarian-fed. Pasture-raised animals have the ability to roam and munch on grass from the land but their diets can also be supplemented with grain and they can eat grasses that have been sprayed with synthetic fertilizers. Organic does not mean grass-fed. Beef labels that display the term “organic” could have been fed organic-grown corn, soy, or grain. Vegetarian-fed means that the animal did not eat another animal. What animals eat not only has an effect on our health, but on the animal’s health as well. Grass is the natural food for cattle. These animals have the ability to convert the cellulose in grass into proteins and fats via a fermentation tank found in their guts. This process is know as rumen. When cattle are fed foods not familiar to them such as grain, soy, and corn, “feedlot bloat” can occur. Author Michael Pollan describes this as gas that is built up from too much starch and too little roughage in the animals’ diets. Normally, gas would be expelled through belching but because of the excess grain, soy, and corn they are being fed, the process of rumination stops and a slimy foam traps gas inside the animal, applying pressure to its lungs. This creates a very uncomfortable environment for the animal and can lead to various health problems and even death. Corn in cattle’s diets can turn what is a neutral stomach (humans have acidic stomachs) into a very acidic one. This can lead to subacute acidosis, which requires antibiotics, can lead to heartburn, digestive complications, diaharreah, ulcers, bloating, liver disease, and a weakening of the immune system. So now you’re probably asking why the heck these animals are even being fed grains, soy, and corn in the first place? One reason is that those foods are abundant and cheap, due to subsidized grants that were made available between 1997 and 2005. These grants saved feedlots about 35 billion dollars during this time, by reducing the cost of the feed for cattle and other animals to a fraction of the cost. Both grass-fed and grain-fed beef contain omega-6 fatty acids, however, grain-fed beef contains virtually no omega-3, which makes it very inflammatory (1). If you are unable to consume grass-fed beef because it is difficult to find where you live or because it’s out of your budget, I suggest buying the leanest cuts of grain-fed beef that you can find. This will limit the amount of omega-6 that you are consuming, and will make the meat less inflammatory. Also stay away from industrial seed oils and maybe think about including fish, krill, or another omega-3 supplement in your diet. You can even consume a little more salmon and other wild-caught fish as a way to improve your omega-6 to omega-3 ratios. One reason that grass-fed beef contains more omega-3 is that the grasses these cattle eat contain omega-3 in their chloroplasts. Roughly 60% of the fat composition of theses grasses is actually omega-3. But, as well as grass-fed beef containing more omega-3 fatty acids than grain-fed beef, there are a number of other differences between the two types of beef. Grass-fed beef contains higher levels of vitamin E, CLA, vitamin B, vitamin K, and other minerals. Grass-fed beef is usually lower in calories than other beef because of it has a lower fat content than grain-fed beef. Grass-fed beef also comes with more creatine and carnosine, which are important for muscle and brain health. Grain-fed beef is definitely cheaper and easier to get your hands on than grass-fed beef. Grass-fed beef will typically run you about $7-$10 per pound and perhaps even more depending on the particular cuts you can purchase. Grass-fed beef can be purchased at Whole Foods, Trader Joe’s, Sprouts, and various health food stores. I’ve noticed that it’s easier to find at traditional grocery stores now and that you can get great deals on grass-fed beef at Fresh & Easy (where it’s usually about $6.99/pound). Ask when the upcoming sales are at markets you frequent. Stock up and store produce in a large freezer when you find good deals. Shop at farmers’ markets near you and make friends with the farmers. Ask for discounts on bulk purchases. Check out Eat Wild to find great grass-fed food near you. You’ll also most likely notice a difference in the texture and taste between grass-fed and grain-fed beef. Grass-fed beef tends to be a little tougher and chewier because of the muscle it contains. This is can be put down to the animals spending more time moving and grazing than those stuck in feedlots. Feedlot animals are born strictly to grow fast and to produce as much meat as possible. This can cause problems, not only for the animal and us, but for the environment as well. My dad is vegan and I like to participate go vegan with him for a couple of months a year. If you have any vegetarian or vegan friends and have discussed their nutrition with them, I am almost certain that one of the reasons they will give you for their approach to nutrition is that they would like to leave less of an environmental footprint on this world. I totally respect this reasoning and am all for it. However, eating meat, veggies, and fruits that are mass-produced has an impact on our environment, though this depends on how they are farmed. Both grass-fed and grain-fed beef take a toll on the environment, but grass-fed beef definitely leaves less of a mess. Meat from grass-fed animals requires only one calorie of fossil fuel to produce two calories of food. Many grain and vegetable crops require from five to ten calories of fossil-fuel for every calorie of food or fiber produced. Grazed lands help slow global warming by removing carbon dioxide from the air. Grazing land in the Great Plains contain over forty tons of carbon per acre. Cultivated soils contain about 26 tons. With grass-fed meat, it takes roughly 1,020 gallons of water to produce one pound of meat. Farmed meat requires about 2,550 gallons to produce the same one pound (2) To give you an idea of how much water that actually is, it only takes about 50 gallons of water for apples, carrots, and potatoes per pound. Feedlots require fossil fuel-based fertilizers and pesticides. According to ecologist David Pimental it takes about 284 gallons of oil during the lifetime of cattle to make the fertilizer that is used to grow the corn that is fed to them (3). Grass-fed and organic beef do not require so much. Grass-fed animals fertilize on their own soil, while at the same time helping to create healthier top soil for grasses to grow. In the feedlots of grain-fed animals, manure piles up and releases ammonia and other gasses into the air. This also overloads the soil with nutrients, nitrogen, and phosphorus, which can wreak havoc on the top soil and underground water supply. Grass-fed animals do require a lot of grass and roughage as part of their diet, so this can take its toll on the environment. If you do eat meat, one way you can leave less of a footprint on the environment is by making sure that the animals you eat are used fully by consuming as much of them as possible. There are tons of articles, posts, and opinions about whether or not beef and meat in general should be consumed. For every research paper suggesting you don’t eat it because of health concerns, there’s another that will tell you just how great it is for you. Some of you prefer not to consume animal proteins due to spiritual, religious, humane, or other reasons, and that’s cool. I have total respect for that. But if we’re talking about whether or not meat should be eaten at all, I say it should. The human ability to dispose of dietary cholesterol, the way our gastrol intestinal tract is laid out, the various enzymes and the acidity in our bodies, and the design of our teeth and jaws to enable us to chew and rip meat, suggest to me that humans are supposed to eat meat (4). Most health concerns related to the consumption of meat revolve around consuming 200+ lbs per year (that’s a ton!). Using the proper portion sizes can help to elevate this problem. If consuming meat with added hormones is a concern for you, buy grass-fed and organic, but also remember that, back in the day, only bulls were eaten, as it was often considered inappropriate to feast on females. The females were also left untouched for reproduction purposes. Bulls are full of natural hormones, and in the past they contained much higher levels of hormones than cows receive in the form of artificial hormones on farms today. Lastly, remember that what an animal eats is what you get. The nutrients they consume will be stored in their tissues, before becoming available to you. What are your thoughts on the grass-fed versus grain-fed beef debate? Did I leave anything out here that you were curious about? PS: I want to leave you with a few awesome resources, so that if you’re having a tough time finding grass-fed beef in your area, you will be able to order it online. Effects of free range feeding on Omega: Lopez-Bote, C. J., R.Sanz Arias, A.I. Rey, A. Castano, B. Isabel, J. Thos (1998). “Effect of free-range feeding on omega-3 fatty acids and alpha-tocopherol content and oxidative stability of eggs.” Animal Feed Science and Technology 72: 33-40. Duckett, S. K., D. G. Wagner, et al. (1993). “Effects of time on feed on beef nutrient composition.” J Anim Sci 71(8): 2079-88.